This is a response to Alex Grace’s blog entry about the exhibition in which we both have work, Facing You. Facing you is part of the Fringe! Gay Film Fest. It will be important to read her blog entry (which again, you can find here) before reading what follows below. Like Alex, I felt I had a lot more to say about the issues raised during this panel discussion not just about my own work, but about many of the things discussed. However, I want to focus on what Alex has written as it relates to my work, but specifically about the ideas of queerness and safety and how Alex puts them with notions of “undiscovered treasure” or “mystic” or “deserted… away from other tourists” and therefore at odds with “mainstream” “commercial” and the idea that mixing any of these things could possibly “ruin” something. My understanding of queer is a term that desires that you don’t have to present an identity card before entering a meeting. Heterosexuals can join the queer movement. Bisexuals can join the queer movement. Queer is not being lesbian. Queer is not being gay. It is an argument against lesbian specificity: that if I am a lesbian I have to desire in a certain way. Or if I am a gay I have to desire in a certain way. Queer is an argument against certain normativity, what a proper lesbian or gay identity is. I share Butler’s discussion of the term here because I very much identify and agree with her description of queerness as a notion of something that is not other, but something that is just an argument against something. I also think this description has a lot to do with my problems with the ways in which “queer” was largely treated during the discussion, as well as in relation to the exhibition in general. I really feel that queer to me, now, definitely does not mean words like “difference” or “other” that yes, historically, have put queer in this “outsider” space. To be sure, I’m not denying or avoiding that queer has historically meant these things, and actually, at some stage I embraced being an “outsider” or “different” or a “freak,” and well, I still do, honestly. But, to me, now, it’s less about being DIFFERENT, and more about being me whatever I want to be. I guess that me isn’t very much like a lot of women my age—which brings me to the terms normative, normativity and heteronormativity—I won’t get into those right now, but quickly, it’s to say that the way I live my life is quite a bit unlike my heteronormative counterparts. So yeah, I guess that’s different, but, in my life and my work now, I’m absolutely interested in connecting, not alienating, in being in the world, not outside of it. I look at that and I think, wow, I have changed. And maybe that is just about getting older, opening up and seeing that wow there are so many possibilities! It’s not that I’m not interested in the politics and performance of queer gender identity, it’s that this idea has become much more to me than something solely about an identity, but rather it’s become about something much bigger, something more complicated than an identity, but about endless identities that exist and constitute a time and place. I saw the “teaser” for my friend Sam Feder’s upcoming documentary “Kate Bornstein is a Queer and Pleasant Danger” at the Fringe! Film Festival last week. If you are unfamiliar with Kate Bornstein, she is a transgender queer theorist and activist. I really enjoyed Kate’s description of post-modernism, which I feel is very relevant to this discussion of “queer.” Bornstein describes post-modernism as a way of thinking that allows for many different meanings of the same thing at the same time. I feel that to be at the core of understanding queer and queerness, and in turn, me and my work. Oh yes, my work! Ooops, I went a bit far, hope you don’t mind… I enjoy Alex’s thoughts on safety, and safe spaces, in considering what is safe and what isn’t. I’m also wondering about how much of this safety is something we consider very much these days in a huge, progressive cosmopolitan city like London, and I think Alex alludes to that by questioning what is meant by safety. We are not in Uganda where the government actively persecutes people for being gay, nor are we in the year 1930 where being gay anywhere even in London was not okay, even dangerous, and gays had to meet secretively in spaces like gay clubs for safety. 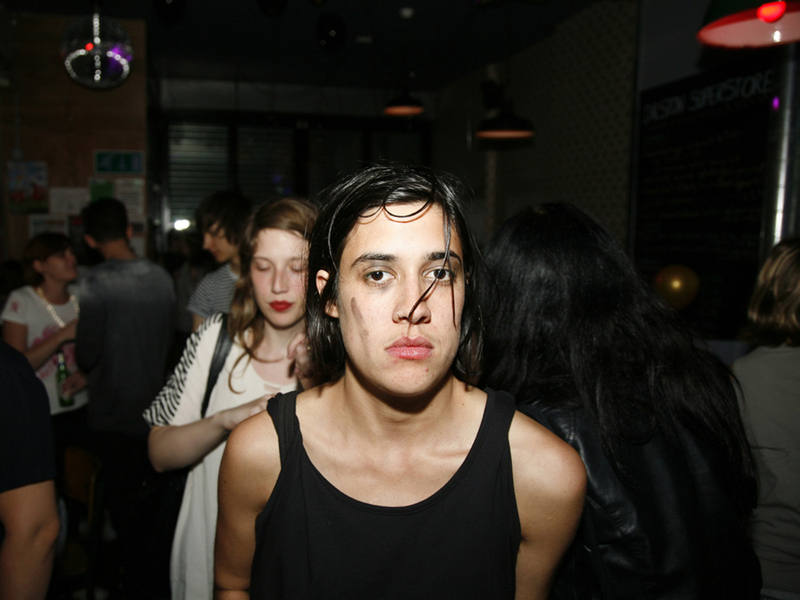 So I took the photograph that is in the Facing You exhibition (see above) in a gay club on a lesbian night. To me, this photo is not about gender, gender identity, safety or being in some special place where only the “different people” hang out. This photo, which is part of a larger project of mine which I call I WAS THERE, to me is of a girl in this club on this lesbian night where I was hanging out. I didn’t know her at the time I took the photo, nor did I know her sexuality, her gender identity or much else about her. I had casually spoken to her a few times prior to taking that photo. This photo and the larger project of which it is a part, for me, is simply a photographic document that is part of an archive of my life, MY life which I describe as queer. That she is in this space, which I’m going to call a queer space because it is definitely a lesbian club night put on by lesbians for lesbians in a bar that has almost only lesbian/gay nights and is most often full of queer people. All of that together makes this image part of my queer archive. My queer archive includes a lot of people, some of whom would not call themselves queer. Most would. Either way, they are in my world which is everything but exclusionary, and everything queer.